Toddler, toddler, toddlers! They are busy little people, aren’t they? From the minute they wake up, they are busy discovering the world around them! This is such a wonderful part of development for them, and can be stressful for parents. It’s a time of artwork on the walls (sharpies anyone?). Lots and lots of spills (hope you didn’t need that whole gallon of milk!). Sneaking OUT of the house and sneaking into everything IN the house! To toddlers, it’s not sneaking. It’s just part of discovering their world!! A higher power must have known this stage wouldn’t be the easiest for parents. The fact that you are reading this post means maybe your life with a toddler is less than picture perfect. In fact, it’s probably more like this…. 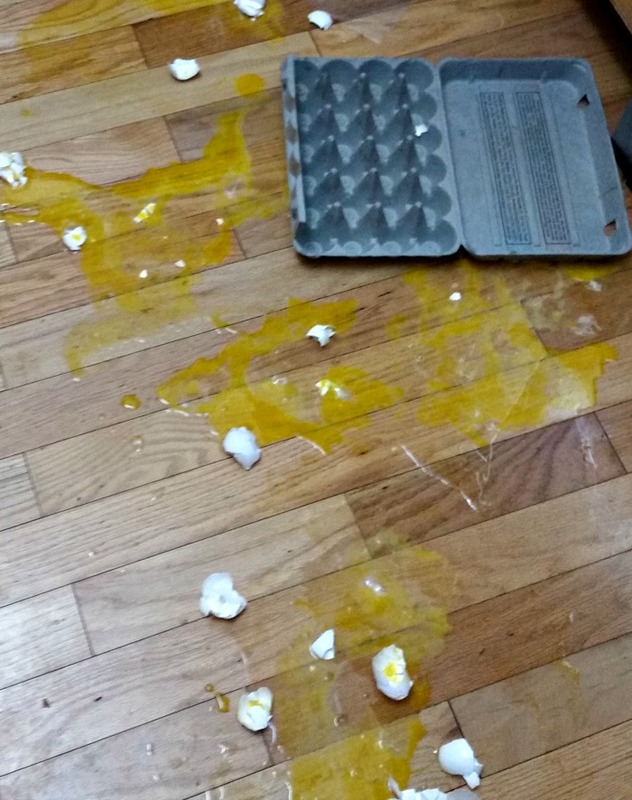 …why the house suddenly got quiet. 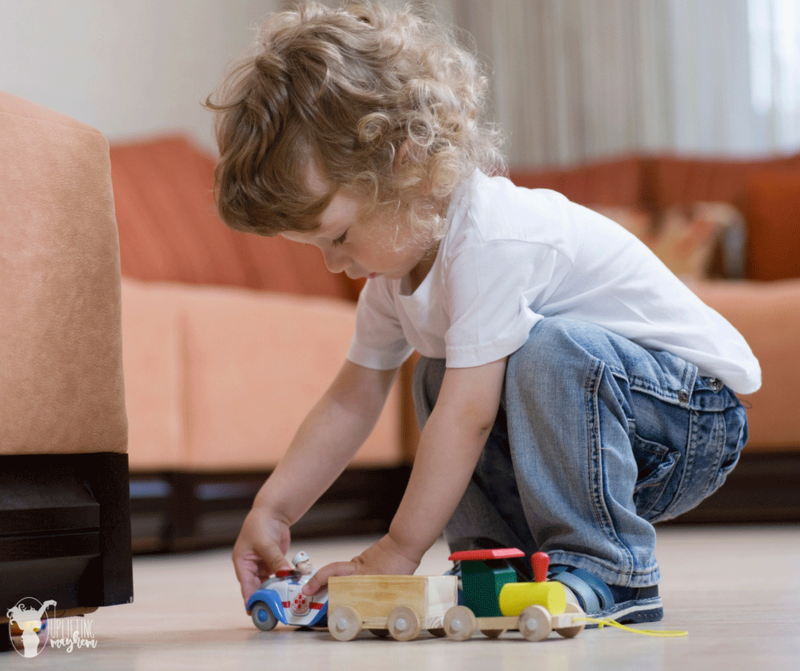 The key to keeping toddlers out of trouble is keeping them busy! They don’t have a long attention span yet and their impulse control is somewhat non-existent, so it’s definitely a challenge! I’m on my 4th toddler, and still learning everyday! Here are a few things I have found to help distract a toddler…and keep my sanity in the process. If you’re lucky, you might even get some time to get something else done on your to do list! 1. Busy bags for home. I LOVE busy bags! I never even knew about them until my sister over at Mother’s Niche starting putting a bunch together for her kids. “Brilliant!” I thought. Busy bags are basically bags with pre-made simple activities that you can store and pull out in a pinch when your toddler needs something to keep them busy (other than throwing the 10th roll of toilet paper in the toilet!) There are hundreds of cool ideas on Pinterest. Some of my favorite ideas can be found here. 2. Quiet bags for Public places. 3. Pre made snack bags. My 2 yr old LOVES snacks! When all else fails distract them with food! I found this cute idea on Cupcakes Kisses and Crumbs for having pre-made snack stations in your fridge and pantry, so you can just grab them when needed. For fun and cute snack ideas for kids, check out our post, 25 Fun and Healthy Snacks for Kids here. 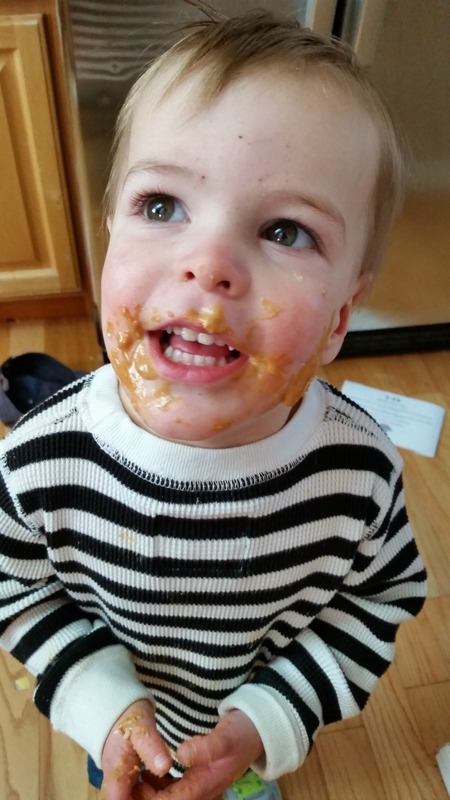 Let’s face it, toddlers just love to make messes, whether we like it or not! Why not give them the opportunity? Shaving cream and an empty table can keep a toddler busy for at least 5 whole minutes 🙂 Another favorite is finger painting with edible paint. I like to use pudding or yogurt. Rainbow Spaghetti is also a very fun ‘messy’ activity for toddlers. 5. Toys that spark imagination. 6. Balls and more balls. Get any ball rolling and a toddler will be sure to follow. I have a bin in my toy room with just balls. Roll them down the hand rail on the stairs, bounce them down the stairs, down the hallway….it’s just great fun! Here are some great ideas for balls for toddlers! The trick to these is not leaving them on the fridge. If they see them all day and every day, they lose interest. So keep these in a box and pull them out in a moment of need (like when you’re trying to fix dinner!) My favorites are these larger animal magnets. My older kids use markers and crayons for everything including school. As much as I tried, I just couldn’t seem to keep them out of reach of my toddler. I finally gave up the battle and just made sure all of our writing utensils were washable (and my walls were painted with semi-gloss!) Crayon and pencil can easily be removed with magic erasers. Everything else I buy washable. 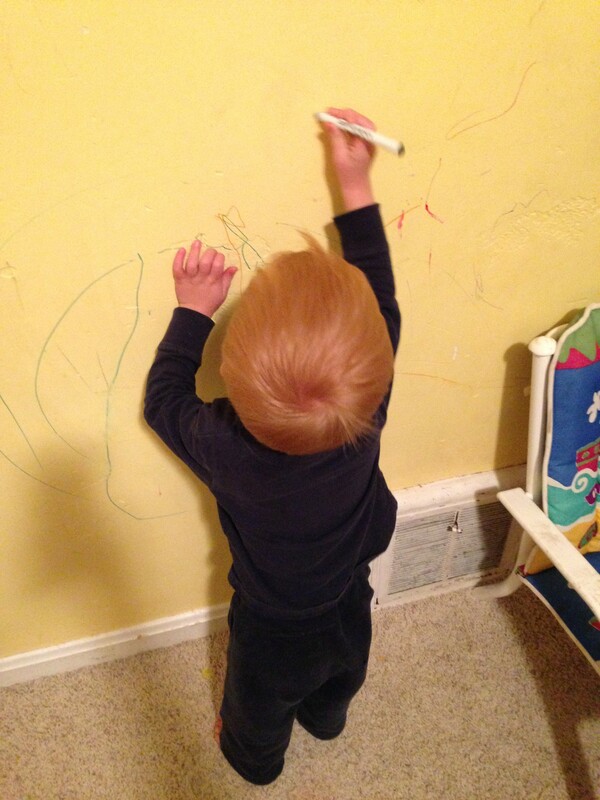 So if you’re little picaso wants to paint a mural, they can go for it! If they wander from their paper and you find a beautiful mural on the wall…no biggie, right? Sometimes my little guy just needs me to stop what I’m doing and just play a game with him for 5 minutes. Then he is happy to go on his way and let me get things done. Hide-n-seek is a great no-planning-necessary game that every toddler loves! Eazy Peazy! What toddler doesn’t love to dance a jig? The Pandora app has plenty of kid stations if you don’t happen to have your own collection. Turn it on, crank it up, and feel the joy of living life through their eyes, even if just for a moment! 11. Empty containers and small objects. How many plastic containers do you go through in a week? If you have a toddler, don’t throw them away!! Save them in a box. They love to put little objects in them and find the lids that go to each container. A box of empty plastic containers and lids = 1 happy toddler, which also = 1 happy mom! Like I said before, it’s all about discovering new things. If you find your little minion losing interest in all the toys, it’s because they’ve already discovered them all. I love this idea on Mother’s Niche for a toy rotation. I promise you, if you start putting a few new things out every now and then, it will make the world of difference. Oh, how a toddler loves to play with water! Mine likes to dump his cups on the kitchen floor! What fun, right? Well, fun for him, not so fun for me on my hands and knees! Toddlers are too short to reach the bathroom or kitchen sink (a blessing!) but what about the tub? Many messes can be had in the tub with lots of fun! Shaving cream works great in the tub. You can even put mounds of it in a silicone muffin tray and color it with food coloring. Give em a paint brush and let em go crazy! When it’s all over, it all goes down the drain. A bowl of water with measuring cups and spoons will allow them to have fun with water in the tub without flooding your bathroom floor (yep, done that one too!) The back yard is also a great place to play with water. If you’re really brave, let em play in the mud. Remember how much fun that was when YOU were a kid? Blow up a couple of different sizes of balloons and let your child get some exercise punching and playing with them. Cardboard boxes can provide hours of entertainment! Get one big enough they can crawl in, cut a window and and a door! My boys absolutely love these at all ages! 16. An old wipe container and pieces of material! I love this idea! Use one of your wipe containers and fill it with pieces of material! Then have your child have fun pulling out each piece of material through the hole! 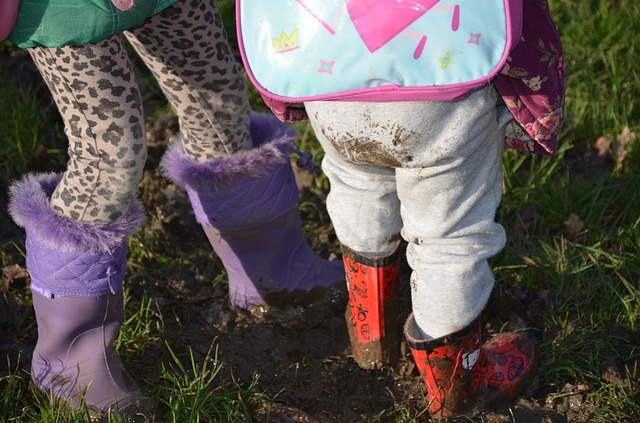 Want more great toddler ideas? I love this post: 10 Rules for Parenting toddlers. 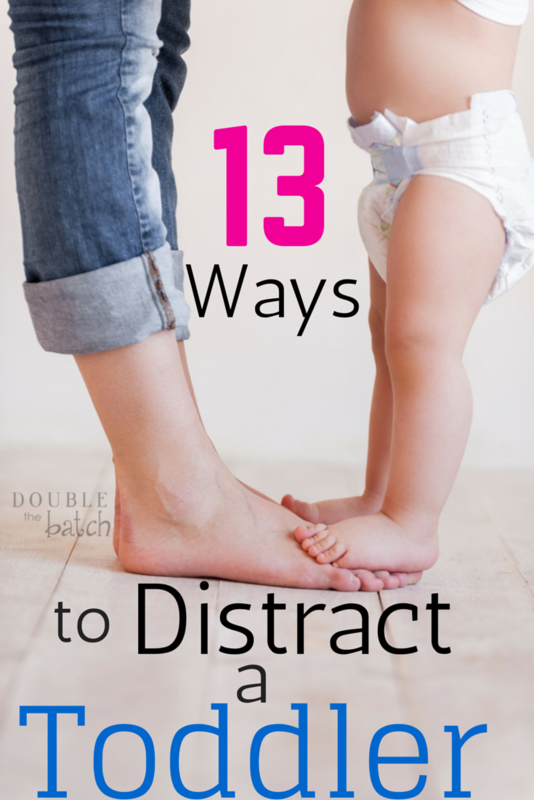 What fun ways have you found to distract YOUR toddler? Please share in the comments below! We could all use new and great ideas! This post was originally written in 2015. It has been updated and current.